What inspired you to choose Hotel Management? “I had a natural inclination towards creative things from the beginning. I was an average student, not clear on what career to pursue till I passed schooling. It was my father who came across this new booming career through the newspapers and one day asked me to give it a shot. So I did. I chose cooking as my major subject. It started exciting me and I realized that this was what I actually want to go ahead with. I began my formal career as a Food Production Trainee in the Oberoi School of Hotel Management and was selected for the Kitchen Training Programme where I got the opportunity to hone my skills. After graduating from Management School of Oberoi Hotels International, I joined ITC Group in 1997. I decided to popularize the goodness of Indian food sans any western influences. I did it pure Indian style. I began doing seminars, workshops, road-shows, TV shows, writing books, and what not to increase people’s knowledge base and bring back the lost pride of Indian cuisine. This has borne some fruits. But I alone cannot bring about radical changes. We all have to work together. While Indian food is better placed in the global arena today, there are miles to go. Who was your inspiration when you joined this line? How involved are you with the kitchen financials? Forecasting: You have to calculate how much food you have to purchase for the next day. Profit Management: You must understand that once you buy something, cost has been incurred. Now how you make profits out of it without compromising the quality, is the game. Here your business acumen and salesmanship play a major role. Guest Understanding: when you have a party in your restaurant, you need to be aware of what kind of people are coming, how many of them are coming and what their food preferences are. Notably, there is different food consumption in different cultures. Food consumption also differs with occasions. It would be different for a wedding, a cocktail and a wholesale dealer’s outlet opening party. Yield management: Yield standardization is where the profits lie. On hundred kilo de-boned chicken, did I get 42 gram chicken or not? If I got, say 35 gram, it means more meat is thrown with the bone. How much was the wastage? Such things have to be calculated on a daily basis. While cooking you also have to ensure that the dish is neither over-cooked nor under-cooked. Else it results into wastage and translates into immediate losses. Price-to-Portion Ratio: Chefs must carefully decide on the portion size for the price it would be sold at. The worth of the dish should match its selling price. And the portion size of each dish should be same for everyone. It shouldn’t be that someone is getting 100 grams and someone only 70. At the same time, we must watch out for competition. You have to outdo them by being reasonable in costs, best in quality and high on profits. How many applauds one gets for one’s dish does not matter at the end of the day if one doesn’t make profits. The interview conducted by India Hospitality Review over Lunch at ITC Maurya Sheraton, details of which can be found at their appropriate section. The King of Pop arrived in Mumbai on October 30th, 1996 at Mumbai’s Sahara airport. 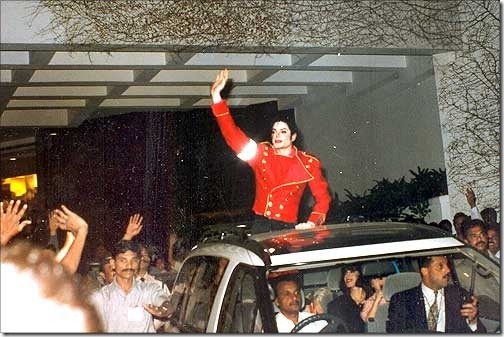 During his stay at The Oberoi Hotel, Jackson surprised the entire staff by mingling freely among his fans, who thronged at the hotel to catch a glimpse of the ‘King of Pop’. According to Butler Manager, Sandeep Walia, who was attending to him with a team of three butlers, Michael loves sweet white wine. That is probably the only kind of alcohol that he consumed during his stay at the Oberoi. Apart from that, he loves orange drinks, Fanta being his favourite and a special German orange drink, Gatorade, which he carries with him. Michael drinks a lot of Diet Coke as well, prefers his drinks at room temperature. Jackson has a penchant for chocolates too, so The Oberoi made sure there were chocolates, of all shapes, sizes and flavours kept in every reachable corner of his room. 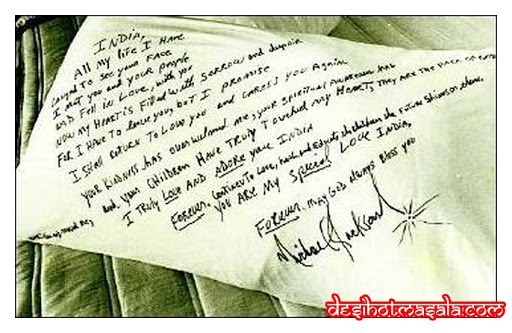 During his stay in Mumbai, Jackson relished several Indian cuisine, including South Indian and Mughlai.